Bitcoin was supposed to be the “anonymous” currency, sadly it’s not entirely true. Obviously, you know that if you’re here on this Bitcoin Tumbler services article. Now it’s a fact, that Bitcoin is more privacy-oriented as compared to any other flat currency on the planet, but “anonymous” isn’t the right word for it. And that’s the reason we started scribbling this article down. By the end of this piece, you’ll have some of the most stable, trust-worthy top 5 Bitcoin Tumbler services (Bitcoin mixing service) at your disposal. 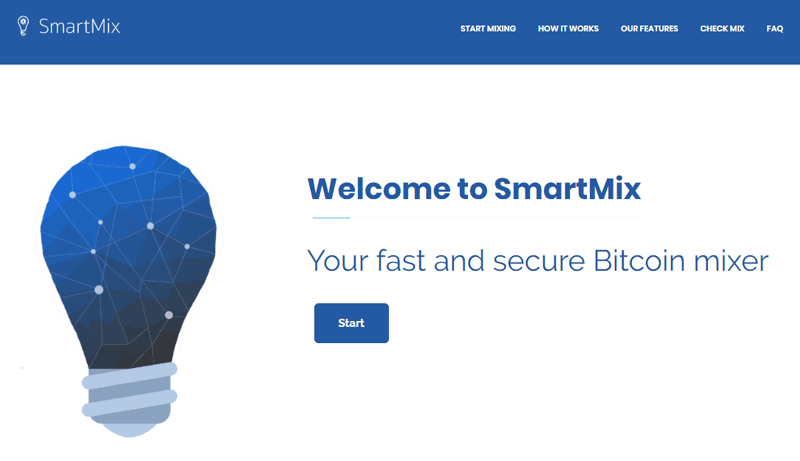 What is Bitcoin Tumbler or Bitcoin Mixing? Bitcoin transactions, even though are mostly nameless, can still be tracked back to quite a few of your real-life elements, and possibly identities as well, because every transaction is engraved in the Blockchain, and proper analysis of that does yield some unwanted footprints. That’s where Bitcoin mixing services come to your rescue, they work on a simple mechanism of breaking down your Bitcoins into many different parts and mixing those parts with other broken parts from other clients. Or in other words, the source and destination of the coins are de-linked so no one knows where a specific set of coins exactly went. 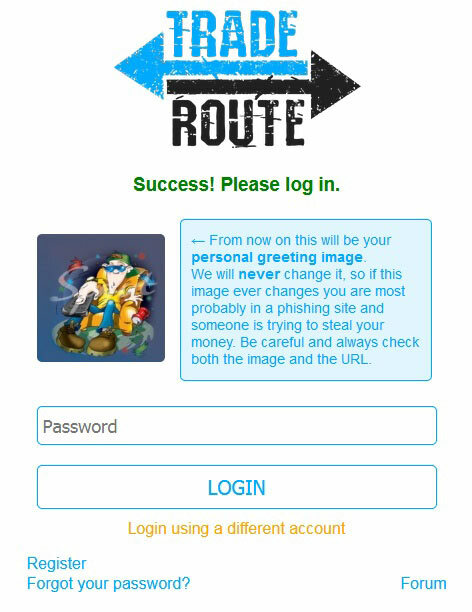 Here’s an image from Tech.eu which describes the process in its entirety. There obviously is a fee involved in the process, but it mostly is negligible, and at times is also user-controlled. 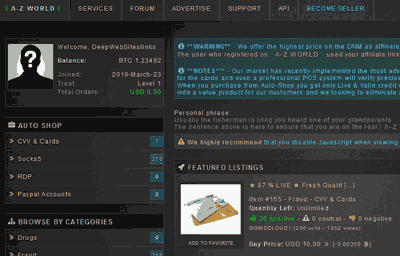 Bottomline, a Bitcoin Tumbler or bitcoin mixing service makes your coins anonymous in the real sense, the complete the “anonymity” promise that Bitcoin, So here are the top Bitcoin Tumbler services you could employ right away. Before check out these five bitcoin tumbler services, first I want to share with you comparison charts with all top 3 mixing service. This comparison chart can help you to find the best bitcoin mixing service for you. Let’s check out! No Logs Policy: Deleted after 7 days. Max Time Delay: 24 hours. No Logs Policy: Deleted after 24 hours. If the chart doesn’t quench your thirst for information,and you still wish to get more and detailed information about these top ten listed bitcoins mixing service then you can go through the fine print on this piece. SmartMix is being listed at the #1 spot here, well that’s not without substance. The top reasons why I’m in love with this Bitcoin tumbler is because it’s fast, takes care of our anonymity and privacy, and has a very negligible fee. The payout is almost instant, all it needs is 2 confirmations for the dirty coins being sent in to be cleaned or tumbled. No account needs to be created to clean your coins either. They have advanced options which let you set “delayed payouts” which further increase your anonymity and make it hard to link the coins going inside to the coins coming out. There’s even an option to add up to 5 addresses, so your coins are broken down into 5 different parts and sent to the different addresses again adding another layer of anonymity. The minimum amount too is pretty low being just 0.001BTC while the maximum limit is 15.32BTC. It’s pocket-friendly as well, with the fee being just 0.5% per mix + 0.0001BTC/address, in fact, it probably is one of the lowest fee in the industry altogether. As for anonymity, they delete all logs related to your mix after 7 days which finally erases the last thread which could ever be linked back to you. So yes, enough reasons to list it at the #1 spot, don’t you agree? 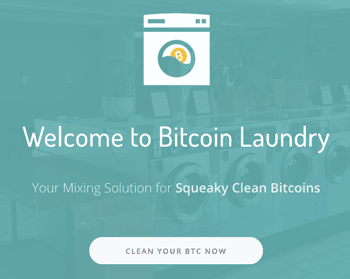 Bitcoin Laundry is another one of the mixer that deserves to top most Bitcoin mixer charts based. For starters its user-interface is one of the simplest and easiest to understand. Then, it supports as many as 10 additional addresses, which is the maximum most mixers on this list support. 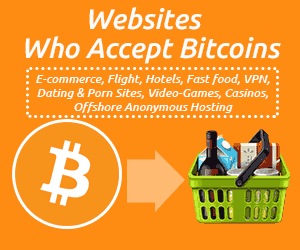 Its fee too is acceptable at 0.1% of the transaction amount + 0.00008BTC/extra address. The minimum limit too is quite low at just 0.0005BTC while the maximum limit depends on the real-time reserves. Bottom line, apart from lower user-control on fee and time-delays it’s pretty perfect. 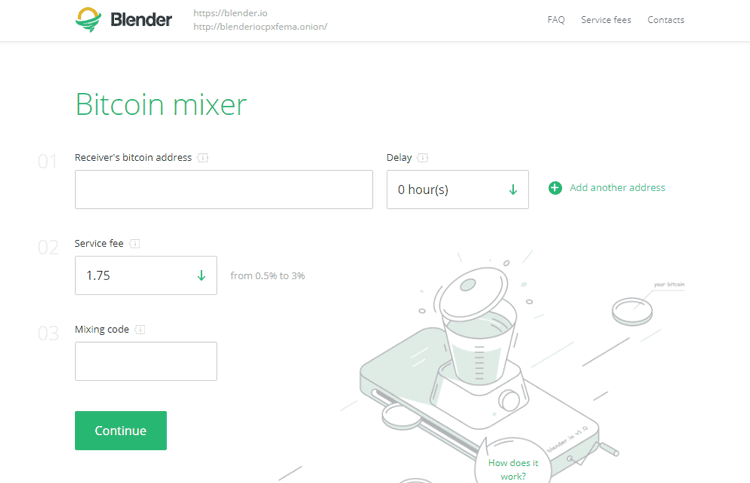 Blender.io is one of the most pocket-friendly, easy to use and customizable Bitcoin laundry platforms in the industry. PrivCoin is one of the best Bitcoin Tumbler services, that I’m stating based on my personal experiences and the positive reviews of other users on the Internet. It works both as a Bitcoin Tumbler, as well as a swapper, meaning you can clean your coins, and receive them in a different cryptocurrency as well which further adds to their anonymity. As a Bitcoin Tumbler, they let you set a custom service fee, the higher this fee is, the better your coins are anonymized. There’s a time-delay option as well which let’s you add an extra layer of protection by delaying your transaction by up to 24 hours, so you receive your coins not instantly but at a later time set by you. 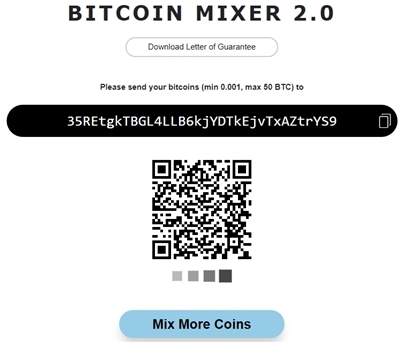 The minimum fee of mixing coins for Bitcoin is 0.8% + 0.0008BTC / forwarding address. Note that there is a minimum transaction limit of 0.01BTC/transaction, and anything below that limit is still accepted but considered “donations” and hence isn’t returned to the senders. As for confirmation, it needs 1 confirmation before it cleans your Bitcoins. And the time needed for the whole process is generally instant, except when you’ve manually specified a time-delay. Also, obviously there also is a “Guarantee certificate” which helps you resolve any future conflicts and issues. It also features a “no logs policy” like all the other Bitcoin Tumbler services on this list, and automatically deletes your order history and all the other data after 24 hours. Well, this is just one of the many available Bitcoin Tumbler services, so let’s head over to the other available options. Bitcoin Blender isn’t as heavily decorated as PrivCoins, as far as the webpage design goes. 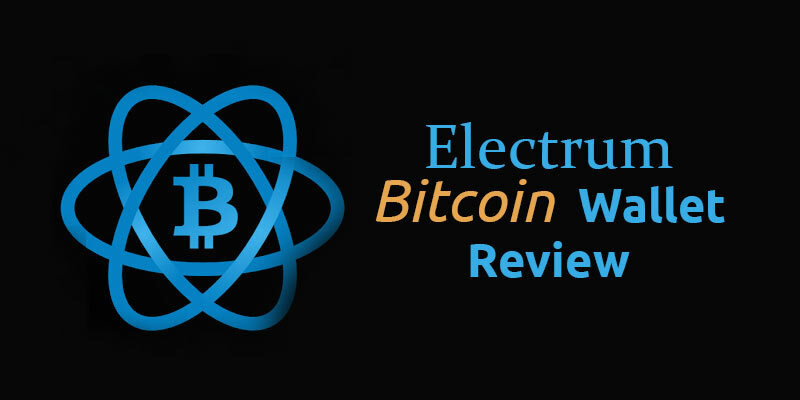 But the services and reviews are in no way less as compared to any of the top Bitcoin Tumbler services on the web. Login enabled account: Requires you to login, provides for more control than the quickmix account. Although there’s a special program, or incentive so to say, if amounts worth more than 10 BTC are deposited within a time-frame of 7 days, the fee is reduced by half! Obviously, there also is the time-delay feature, allowing us to delay the transaction by as much as 24 hours. 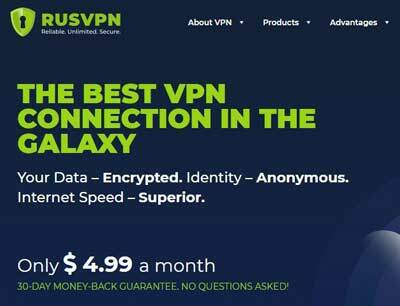 As for security, it supports 2-factor authentication, facilitated with a customized PGP key which ensures only the holder of the PGP key along with the knowledge of the password can access your accounts. And finally, there’s a no logs policy as well, and all the data including deposit addresses and support messages are deleted after 10 days. 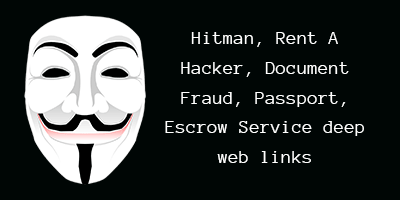 Grams itself is a brand on the Darknet so I believe not much needs to be said about it. Grams Helix is one of its subsidiaries and is one of the most reputed and widely used Bitcoin Tumbler services out there, it’s simple, modern, and definitely trustworthy. Grams supports only Bitcoins for now. It needs 2 confirmations before it cleans and sends you your coins. It obviously supports time-delay, but it’s automatically set to “2 hours” for some reasons. It also supports “Random transactions” for the deposit, the deposit address changes after each transaction and allows you to send more than 1 transactions to Grams Helix instead of sending in all your coins in a single go. The same is also supported for the “output addresses” (where you receive coins) and you can input as many as 5 different BTC addresses where your coins are sent after cleaning them. The coin-deposit address is valid for 8 hours, and any transaction not done within these 8 hours won’t be received by the platform. It can instantly clean your “not so clean” Bitcoins and send them to you because of their reserve stock of clean coins, or there can be a delay of 30 minutes on an average. The minimum transaction limit is 0.02BTC and the maximum limit is 21Bitcoins. The fee GramsHelix charges is at par with what the other Bitcoin mixers are charging , that’s 2.5%. It’s completely anonymous, and there’s no login, no PGP encryption, or any kind of authentication involved. CryptoMixer is yet another simple yet trustworthy Bitcoin Tumbler service. And one of the primary differences it has compared to the other platforms on this list is that it can accommodate really “large volume transactions”. Their claims to have Bitcoin reserves of over 2000BTC has been verified publicly (source: https://bitcointalk.org/index.php?topic=1484009.msg15350012#msg15350012) so that also makes sure they won’t be running away with our Bitcoins and adds to their credibility. The receiving addresses have a validity of 24 hours, within which the payment has to be made. There is no Maximum transaction limit as such, considering how their reserve is really huge and you’ll need to be a millionaire before you can run them out of funds, and if any limit as such is involved, you’re notified during the process itself before you make the payments. The minimum transaction limit is 0.001BTC, anything lower than this is again considered donations like in the case of PriveCoin and isn’t sent out to the customer. Also, it offers us additional control, by letting us control how much % of the Bitcoins will be sent in 1 transaction to one wallet address. Needless to mention, you can set a custom fee for added anonymity and they also provide a letter or guarantee like all the mentionable Bitcoin Tumblers out there. Bitcoin Fog is another contender which easily has the potential to be the best Bitcoin Tumbler, but as of now, it’s not there (yet). But, as a general name in the Bitcoin mixing game, it surely holds some water. 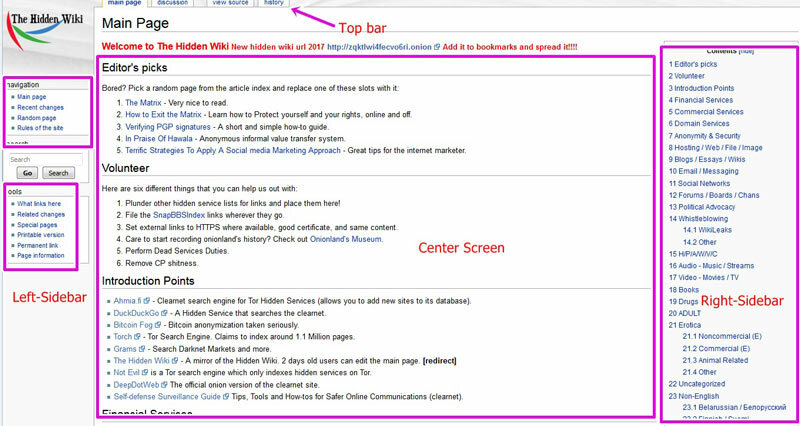 It’s a TOR only site (like most other Bitcoin mixers) and the actual mixer works only on the TOR network. The only disappointment for me was the fact that it’s a “registration only” platform, and even though no personal information is asked, registration isn’t something I’m comfortable with. It has a minimum withdrawal limit of 0.01BTC in place (although it was recently decreased from 0.035BTC so it hasn’t yet been updated on the deposit page), which makes it the only platform in this whole list of Bitcoin Tumblers to do so. A withdrawal limit also acts as a “deposit limit”, because anything less than the withdrawal limit won’t be allowed to be withdrawn. 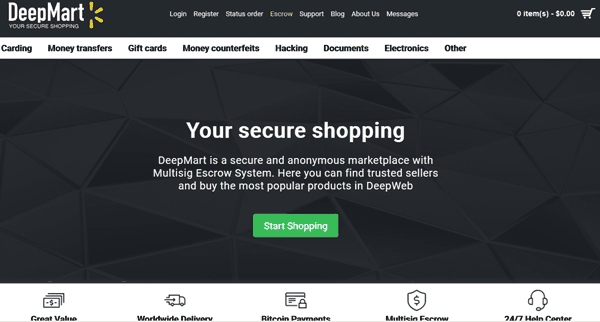 They do support as many as 5 simultaneous deposit addresses in case you wish to use them. As for withdrawals, we can use as many as 20 different BTC addresses to withdraw the funds. It has an additional “time-span” feature, which isn’t the same thing as time-delay. The time-span feature is used to tell Bitcoin Fog the total amount of time, between which you wish the transaction to be spread across. So, even though Bitcoin Fog sends random amounts to your addresses, the total amount is received within the specified time. The minimum value for this is 6 hours, and the maximum is 96 hours. Then obviously there is time-delay (maximum 48 hours), our Knight in shining armour, which delays the transactions by a certain amount of time and the withdrawal process is started after this time is past. As for the fee, they take a randomized fee between 1-3% which is acceptable as well as secure. Although a bump with Bitcoin Fog’s Bitcoin Tumbler services is that they need minimum 6 confirmations for the transaction to register, which is a bit of an overkill if you ask me. Basically instead of operating on the traditional receive unclean coins > send clean coins process, it instead uses a create wallet > fund it with chips beforehand > receive unclean coins > grant access to the pre-funded wallet process! This lets users spend the clean coins even before the unclean coins were sent to the mixer (because the wallet was pre-funded) and that’s the reason I termed it the time-travel mixer. Also it funds the wallets with “chips” which are not the same thing as Bitcoins, they’re basically the private keys which can be exported to your Bitcoin wallets to fund your wallets with the amount the chips were worth. 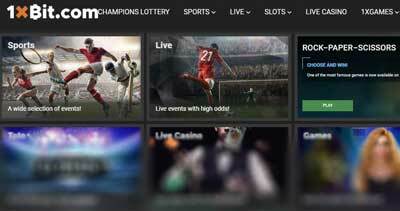 It also lets users bet their Chips which has a chance of doubling the worth of their chips, other advanced features include merging which lets users combine two big chips into one single chip, or splitting which divides one big chip into two smaller chips. Its fee structure too is an unique- “Pay what you like” feature, which not only adds to user anonymity by randomizing the fee but also makes the service more affordable and customizable. Because users completely control when or how much funds they wish to withdraw, it translates into 100% user control on time-delays and distribution control. No logs are kept after a 7-day retention period; or there also is an option to manually scrub all logs whenever you wish prior to this 7-day period. The minimum deposit limit on the platform is 0.0001BTC. Straight off, MixTum.io is the only Bitcoin Tumbler we’ve ever crossed paths with which offers a “Free trial”! The free trial obviously doesn’t mean they’ll just send you free money; rather no fee or commission is charged for this free trial although it’s limited to, and is exclusive for 0.0001BTC tumbling only. Their process of acquiring the clean coins is quite unique, obtained from various stock exchanges such as DigiFinex, Cryptonex, Binance and so on; ensuring cleaner coins than some other questionable sources pertaining to their claimed check using a proprietary algorithm. In the background, a user’s money is first mixed in their pre-mixer with other coins; then sent to the stock exchanges for further mixing with other traders’ coins and then summoned back to be sent back to the users. The major flaw with the tumbler however is its lack of user-control, users have absolutely no control over the time-delays meaning you can’t specify the duration gap between the outputs rather it’s randomized between 1-6 hours. Distribution-control too can’t be controlled and the mixer sends randomized outputs to the addresses. The fee can’t be controlled by the users either and is again randomly set between 4-5%+ 0.00015 BTC network fee, truth be told it’s one of the highest tumbler fee we’ve ever seen. The minimum deposit limit is 0.0001BTC and the maximum being 50BTC/ transaction. All logs are deleted upon a successful mix. They do provide a Letter of Guarantee. Although only 2 output addresses/mix seem to be supported. 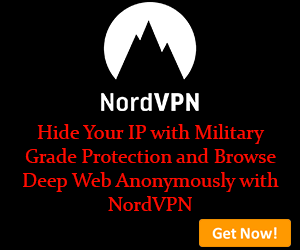 No registration is required keeping things anonymous. Let’s wrap this piece up, note that for any Bitcoin Tumbler to work anonymously and effectively, it’s important that they be trusted. There’s no authority or govt. you can complain to if they run off with your Bitcoins. Hence we’ve only selected the best, most-trusted and established Bitcoin Tumblers for this article, so rest assured, these can be trusted even though some may charge a higher fee, or have more limitations than others. Let me just take couple more seconds to answer a very pertinent question related to Bitcoin Tumblers. 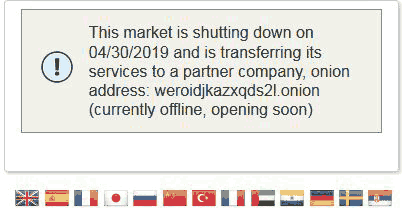 No country on the globe has “banned” Bitcoins directly. They aren’t illegal, and are illicit at best. So naturally, Bitcoin mixing isn’t “illegal” as far as the terms’ definition goes. Also, even if it was, it’d be pretty hard to prove or point the act to one specific individual. So in a nutshell, neither Bitcoin, nor its mixing is illegal, but obviously using Bitcoins to purchase guns, drugs or mixing it to launder money is a completely different story. As long as you aren’t doing anything “illegal” with the coins, you won’t be in trouble, period. 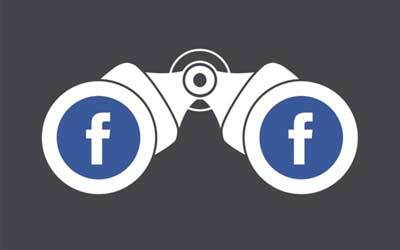 Note: If you like privacy and also want to protect your internet network from government tracking or tracing also want to protect your internet browser records then you may need to check below given articles. Do let me know your thoughts on these top 5 Bitcoin Tumbler services, the one that won you over, and why so?